Slowly, he crawls toward the sound of her voice. In the dark, she is reduced to softness under the scratch of wool, and the scent of her perfume. He is careful, respectful. There are lines they have never crossed, and now is not the time. Except that, when he finds her face, he cradles it with his hands, and brings his forehead to hers. Slowly, they breathe in and out, in and out. He stands, and slowly finds his way to a wall. To THE wall. This one was not like the others. This one is stone. He removes the vial from his pocket, and weighs it. Is it enough? Will it give him all the time he needs? The tincture tastes of antimony and chamomile. The stone softens under his hands, and he presses forward, half swimming toward freedom. Minutes pass, and the darkness does not yield. He can feel his body hardening, his clothes becoming stiff and heavy. It was not enough. Maybe if he’d drunk Marie’s as well, but he had hoped she might follow behind. Perhaps it’s just as well she did not. He won’t make it. He can feel the change coming on quickly now, and there’s no friendly compatriot to administer the antidote. Perhaps in ten thousand years someone will find him embedded in this hill and wonder how the sculpture got there. But of a sudden, his left hand breaks through into the air. He makes a desperate effort, thrusting his right hand forward, dragging part of his body through. His right leg, too, follows, and he looks down to see how far it is to the pavement, when he stops. The next day, the citizens pass by on their way to the market, on their way to work. 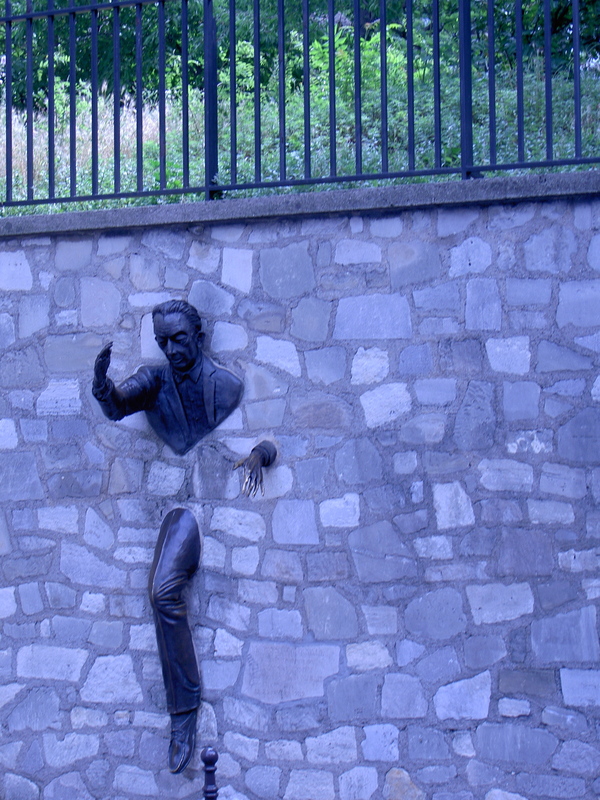 If they notice the new statue emerging from the wall, they do not comment on it. After all, it’s been common the last decade for such things to appear and disappear within days. No one knows why, but then, artists are always such capricious sorts aren’t they? It’s just like them to pull pranks like that. Years pass, and still no one comments on the statue. Nor do they notice that pigeons never roost on it, cats hiss, and dogs shy away. Only one woman–a very old woman–has ever taken note. And her only reaction was to widen her eyes in shock, and then begin to cry. The next day, the statue was gone. ← And now, for something completely different!